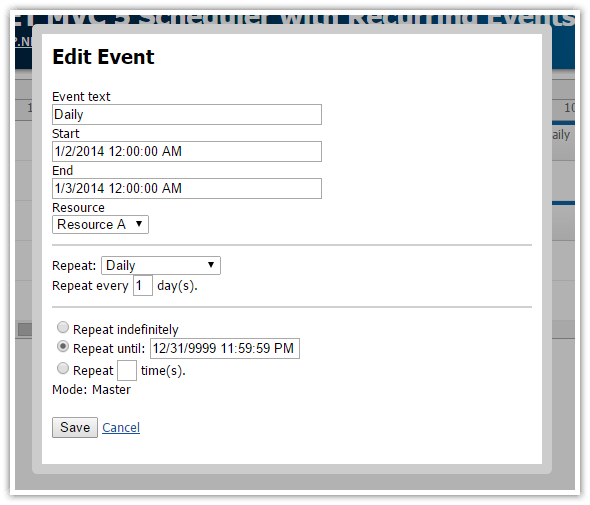 How to create an ASP.NET MVC 5 scheduling web application with support for recurring events. Include sample C# and VB.NET source code. This tutorial shows how to create, display and edit recurring events using DayPilot ASP.NET MVC Scheduler control. This tutorial shows advanced features related to handling recurrence. For an introductory ASP.NET MVC Scheduler tutorial please see Scheduler for ASP.NET MVC 4 Razor (C#, VB.NET, SQL Server). DayPilot ASP.NET MVC Scheduler control includes support for recurring events. 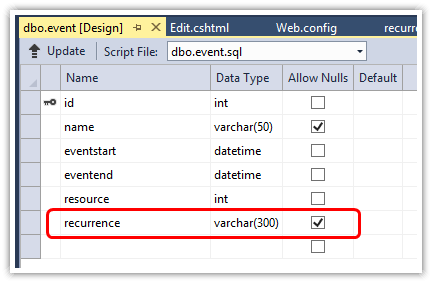 It lets you save the recurrence information in a single string (VARCHAR) database field. The recurrence rule string can be created using RecurrenceRule class. It will let you define the recurrence period (e.g. "weekly"), specify the period items on which the event occurs (e.g. "Monday, Tuesday") and the end rule (e.g. "Indefinitely"). Repeat this event weekly with no end date specified. The event edit dialog is open when the user clicks an event. Depending on the event type we will open the edit dialog. The event type will be determined by the query string parameters. Repeat every <input id="daily_every" style="width: 20px;" value="1" /> day(s). Repeat every <input id="weekly_every" style="width: 20px;" value="1" /> week(s). Repeat every <input id="monthly_every" style="width: 20px;" value="1" /> month(s). We will add a special icon the event box indicating that it shows a recurring event or an exception. We will use event active areas to create the icons. Exception from the recurrence rule are stored as special records in the database. The recurrence field specifies the original occurrence encoded using RecurrenceRule.EncodeExceptionModified() or RecurrenceRuleEncodeExceptionDeleted(). The standard fields (text, start, end) will be used for the exception. The existence of exceptions from the recurrence rule requires careful updating of the records in all types of operations (editing, moving, resizing, etc.). How to change the Angular Scheduler component appearance using a CSS theme. You can use one of the predefined themes or create your own theme using an online tool. How to hide Scheduler rows that have no events using row filtering feature. HTML5 web application for managing doctor appointments. Includes public and administration interface. Patients can request an appointment in one of the slots predefined using the administration interface. Implemented in PHP/MySQL. Angular 6 application with Scheduler component that can filter events in real time (by text, category, length). Angular 6 application that uses DayPilot Navigator component as a date picker for the Scheduler.